Professional custom embroidery digitizing at exceptional quality. Digitizing of logos, patches, emblems, graphics, monograms and patterns. Fast turnaround times and high customer satisfaction. Format conversion for any of the major brands of embroidery machines. 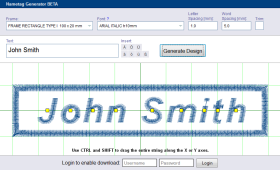 An online solution for creating designs for nametags and labels in seconds, using a large selection of fonts and frames, directly from your web-browser, without any software download. Test test the fully functional program in trial mode, with the save feature disabled. To request an account and/or add credits to your account, please contact us. Web-based visualization and color/thread assignment software for embroidery designs. Convertion to DSZ file format. 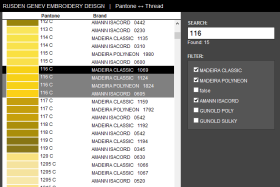 Match Pantone standards colors with corresponding Thread products from Madeira, Amann/Isacord and Gunold. Copyright (c) 2005-2013 Rusden Genev. All rights reserved.